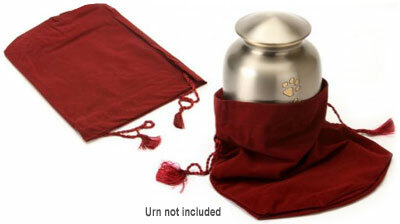 Hedon Black Pewter pet urn for ashes is a beautiful classic urn for your pet's cremation ashes. Threaded secure lid ensuring a safe place for your pet's ashes. 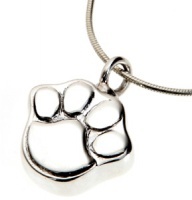 Can be kept as a tribute and memorial or used as a pet burial urn. A beautiful and dignified place of rest. 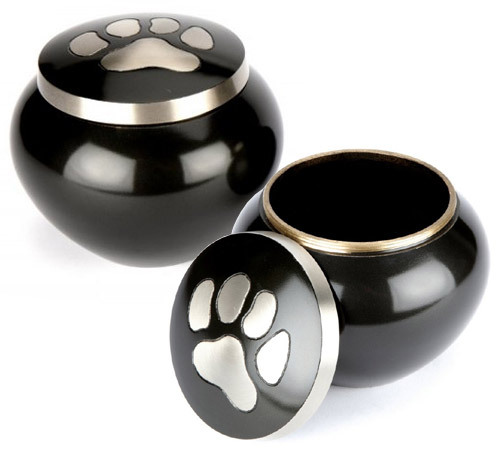 High quality solid brass dog urn finished in dark granite grey/black pewter with a pewter single paw print design. Hand casted and intricately hand designed by skilled artisans. Capacity: 30 cubic inches - suitable for ashes remains of a pet body weight approx 30 lbs or 13kg (suitable for small/medium dogs). Capacity: 46 cubic inches - suitable for ashes remains of a pet body weight approx 46 lbs or 20kg (suitable for small/medium dogs). Capacity: 80 cubic inches - suitable for ashes remains of a pet body weight approx 80 lbs or 35kg (suitable for most large dogs). An optional red velvet drawstring pouch is also available to purchase. Size medium. Dimensions 26cm x 23cm (approx 10 x 9 inches). Not an exact fit. One size fits all. Suitable for approx 5 inch to 8 inch pet urns and heart pet urns.